Last minute romantic cottage breaks in the UK, love will find a way even when time is running out. Find a little love nest for 2 and disappear into the country. How fortunate are couples in love, when that passion and warm glow are more meaningful than anything else in the world. Weekend breaks and holidays in charming cottages for two are that bit more special. Certain areas of the UK ooze charm and tranquillity and are idyllic settings for a romantic cottage break. One of our favourite locations for pretty villages and hamlets surrounded by gently pleasing countryside is Suffolk. The farmland is attractive, there are still wheat fields edged with waving red poppies, quiet lanes where it is safe to walk and cycle. It is commonn to meet people riding horses or walking thir dogs. The various villages are brim-full of history, each has a fascinating story or two that keeps visitors untrigued. Lavenham, the old lady of Suffolk with houses that slope and lean keeping each other upright is a good place to begin a search for a period holiday home. A small cottage for two will be cosy, full of interesting features despite being compact and will have that welcoming love nest atmosphere. The bedroom may have lots of exposed feature beams, a log fire might glow in the livijng room and the kitchen will be just big enough to prepare a candlelit dinner together. Don't be fooled by the historic exterior, the plumbing will be modern and you will find the bathroom to your satisfaction. 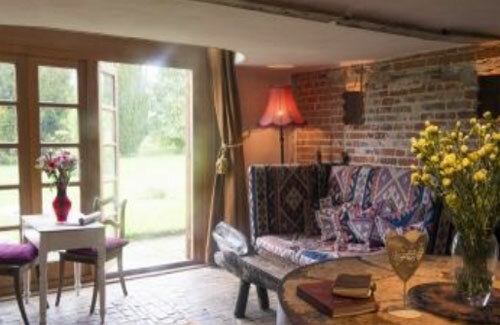 Do survey our wondrous collection of romantic cottages for two people in Suffolk. It is traditional for lovers to run away to Gretna Green is Scotland to marry, they have done it for generations and some still make the journey to receive a marriage certificate bearing those details. We could wax lyrical over the pleasures of a Scottish Highland holiday for two and will. Much of Scotland outside the industrial areas is dramatically beautiful. There are so many superb places for lovers to visit, places with secluded and remote cottages yet a short drive away from a small village or coastal town. In August, Scottish hills are clad in a carpet of vibrant pink heather, the summer is at its height and the days encourage you to get out and about visiting castles, searching for herds of deer in woodland, rowing across still lakes in a dinghy or simply sightseeing. If you would like to see impressively cliffs, puffins and lonely lighthouses, stay in a cottage on the Aberdeenshire coast. For dolphin spotting and whisky distilleries rent a cottage for 2 in Banffshire. The west coast of Scotland is achingly beautiful. A serrated coastline is indented with small fishing villages and backed by towering hills. Perhaps a luxury cottage for 2 on the west coast would create that romantic heaven for you? Do browse through our cottages for 2 in Scotland, it is one of the most romantic locations in Britain. Do visit during the summer months when the weather is at its best, somewhere between May and September.